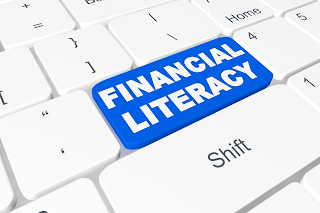 Financial and economic literacy is about understanding the importance of making appropriate economic choices on a personal level, as well as understanding the connection that personal, business, and governmental decisions have on individuals, society, and the economy. I have blogged about programs that help students develop their financial literacy skills. However, it is important teachers are also knowledgeable about the various aspects of financial literacy, as well as the best way to help students attain the knowledge they need to succeed. There is a comprehensive program that can help educators learn about the aspects of personal finance and allows them to earn micro-credentials upon completion of modules and, in some states, credits or points to use for recertification. These twenty, competency-based, micro-credentials cover the following. The modules in the Digital Promise Financial Literacy program include many different modes of learning to help middle and high school students attain the knowledge they need. 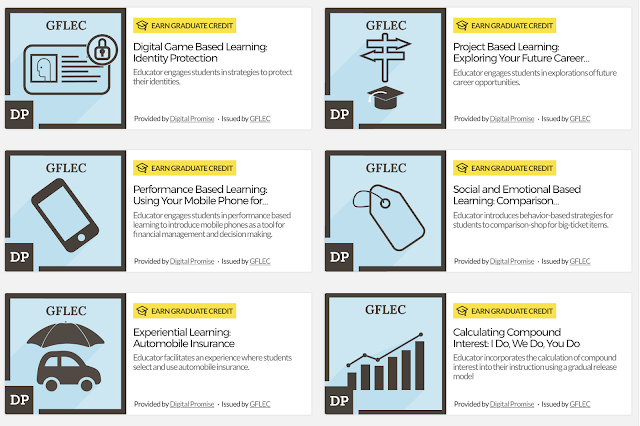 These include digital game-based learning, online discussions, graphic organizers, learning-by-doing, simulation based learning, problem based learning, applied learning, and performance based learning. The modules also target the higher order thinking skills as students reactivate their prior knowledge, compare and contrast, analyze, make decisions, and reflect. The content of the personal finance program is separated into manageable chunks as modules. I explored all the modules, and wanted to share one that targets content I am passionate about - identity protection. I signed up for my free account at Digital Promise which brought me to their micro-credentialing platform, BloomBoard. The introduction to the module included an overview of the method of instruction and links to supporting research for the instructional method for this module which is game-based learning. The introduction also included a suggested implementation of the lesson as well as links to a choice of digital games to use for the lesson. This was followed by a list of the submission requirements for evaluation and earning of the micro-credential. These are shown below and also included a downloadable document which included the scoring guide rubric. Once I had read the background material and investigated the included online financial games, I felt confident to teach the lesson about identify theft to the students. I would allow them to complete one of the games and then to collaborate in pairs, and with the class, about their experiences and gained knowledge. 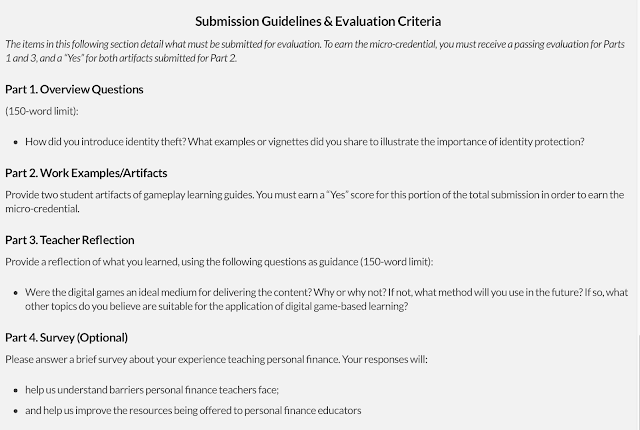 To attain the micro-credential, I needed to go back to the questions above and complete the sections discussing how I introduced the topic, upload two artifacts, and (the most important part) reflect on game-based learning and its impact on student acquisition of content. There was also an optional survey to provide the resource creators with additional information. I was very impressed with both the content and the platform of the module. The choices included allowed me, as an educator, to determine what was best for my students. The included research information and additional resources made me feel comfortable I had attained enough knowledge to teach the topic in an way to help students learn. The assessments to earn my micro-credential were meaningful and prompted me to think and reflect on both the method of delivery and student learning. The Digital Promise/GFLEC financial literacy program can be used across the curriculum, and, in addition to helping students attain the financial literacy skills, it provides educators with the time to reflect on methods of instructional delivery, which can help frame practice in any content area! This is a sponsored post on behalf of We Are Teachers and Digital Promise.